The key to getting a "green light" in Hollywood is a polished screenplay, which means that your script needs to be airtight before it hits the agency or production company story analyst's desk. The simple format rules found in The Hollywood Standard — which you can learn in an hour — come from Hollywood's top expert on script format and will guarantee that your script makes a winning first impression. Thousands of promising scripts never get a fair read from Hollywood because their format is wrong. Poor formatting is the mark of an amateur and in the ultra-competitive world of screenwriting, the wrong first impression can kill your dreams. Your scriptwriting software offers you all these little screenwriting tools. This text gives you what even the best script software can't. A detailed study of proper script formatting, it goes beyond the software and tells you WHEN and WHY to use those tools. 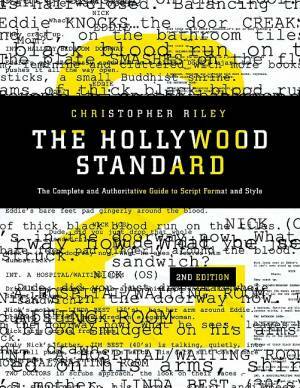 Intended to be kept at a screenwriters fingertips, this new edition of The Hollywood Standard has been expanded and updated, and features easy-to-use, lay-flat binding. With clear, concise instructions and hundreds of examples, this book takes the guesswork out of a multitude of formatting questions that perplex even seasoned screenwriters, waste their time, and steal their confidence. • How to get into and out of a POV shot; what can and can't be included in an establishing shot and much more. • Recommended by the Writers Guild Initiative! The author is uniquely qualified to write about standard script format and style. For 14 years Christopher Riley worked in Warner Bros. acclaimed script processing department, eventually running the standard-setting operation. He wrote the studio's screenwriting software and served as the ultimate arbiter of screenplay format for Warner Bros. and dozens of outside clients that included Amblin, Disney, Columbia, Universal and Productions. Simply put, Christopher Riley knows more about television and movie script format than anyone in Hollywood and shares it all with you. Buy this book. Learn the rules as if your career depends on it; because it does. Christopher Riley is a professional screenwriter and a veteran of the Warner Bros. script department. The author of The Hollywood Standard, he serves as professor of film at John Paul the Great Catholic University in San Diego and previously taught in the MFA program in writing for screen and television at Pepperdine University.